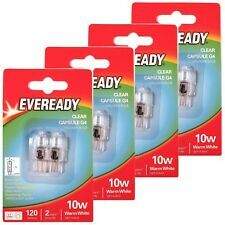 EVEREADY G4 Clear Halogen Bulb 12v – 10w G4 Clear. G4 Pins 4mm. Beam Angle. Colour Temp. Soft White 2800k. Clear Glass. 360 Degree. ( UK Only). 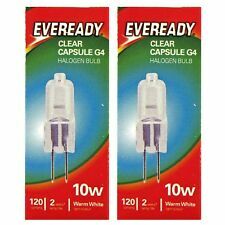 10W 20W HALOGEN G4 CAPSULE BULB 12V UK STOCK!! 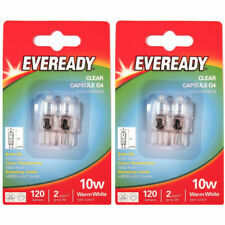 EVEREADY G4 Clear Halogen Bulb 12v – 10w G4 Clear. G4 Pins 4mm. Beam Angle. Colour Temp. Soft White 2800k. Clear Glass. ( UK Only). 360 Degree. 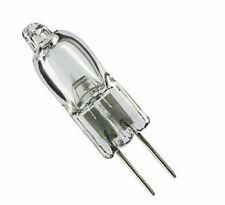 MR11 12v Halogen light bulb with clear. strengthened glass coverand UV stop, bulbs is also dimmable, colour temperature 2700k. fitted with Integral safety fuse to prevent bulb exploding. This is in addition to your statutory rights. 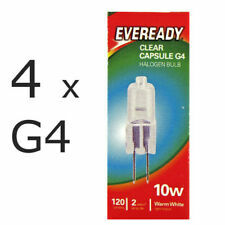 2 x Halogen G4. Bulb life: 3000 hours. 100lms 3000hour. G4 10W 12Volt. 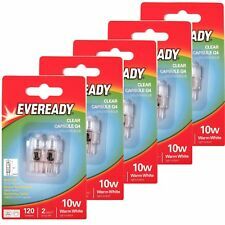 This is Eveready part number. 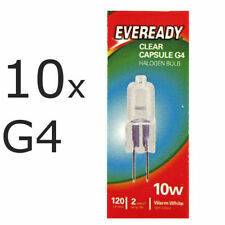 Halogen G4 Lamp: 10W 12V 50HZ. Cap: G4 GY6.35. 100lms 3000hour. 100lms (Lumins). G4 10W 12Volt. (2 Bulbs per order). which will greatly reduce lamp life. you will not be fobbed off with excuses, if we have failed to provide as stated we will start to rectify the problem straight away and.